iWindsurf Community :: View topic - Where to windsurf around Sanibel Island?? Where to windsurf around Sanibel Island?? 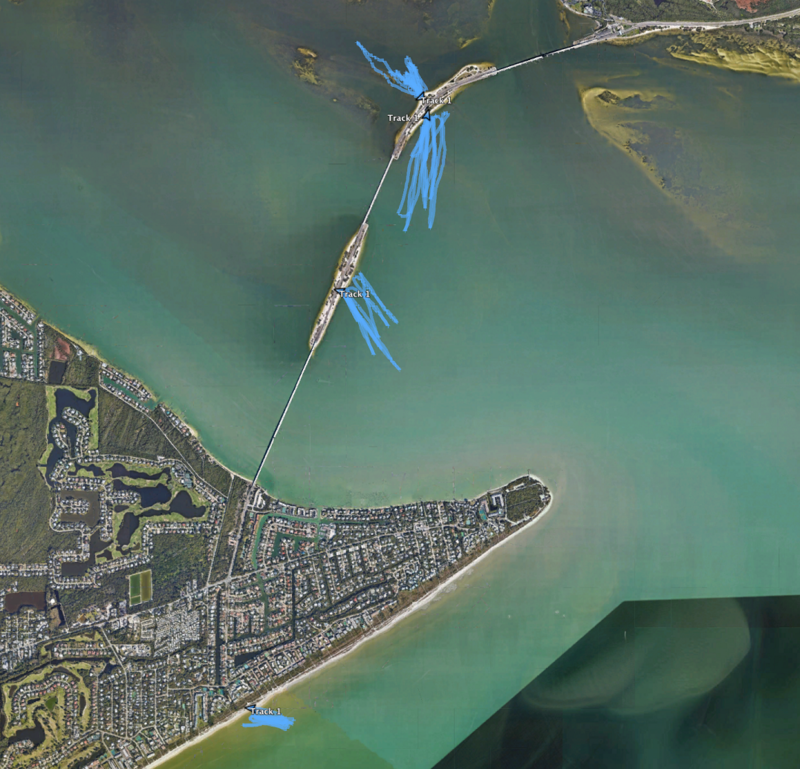 Posted: Thu Feb 13, 2014 9:45 am Post subject: Where to windsurf around Sanibel Island?? The Sanibel Island Causeway towards the mainland end of it was a popular windsurfing and kiting area. I have windsurfed there. Warm shallow waters with plenty of room. One can head out from there to the main channels should they want to explore. Lucky dog, go down there and enjoy it! Fairly warm and nice breeze down there today. 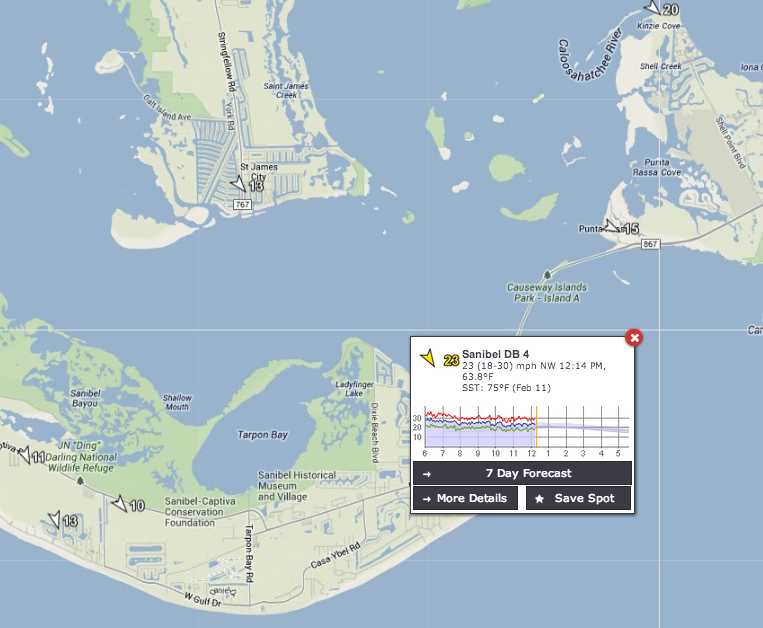 The iWindsurf station located on the channel marker is highlighted in the screen shot below. $6.00 toll to cross the bridge onto sanibel, and its causeway. ft myers beach, bonita springs, wiggins pass do not require access $$$$. gulf of mexico is far superior to the shallow, sand bar filled sanibel inlet areas, IMHO. same amount of driving, come over to the cocoa beach area. paid access to flat water spots is nil. super easy surf/ocean spota include cape canaveral jetty park, paid access, cherie down, free, ft pierce south jetty park. the latter is by far the easiest launch into the ocean until one gets to either hugenaut near jax, or virginia key near miami. For this weekend come to the Masters/Seniors Council Championships at the Island Style Classic at Sarasota Sailing Squardon, 1717 Ken Thompson Parkway, Sarasota FL. They usually have Formula, Open, Hybrid & Kona classes. I'll be there racing in the Kona class. The formula races are usually out in the bay. The other classes usually race together in the area between the island and downtown Sarasota, launching from the public park on the right at the end of Ken Thompson Parkway near the grounds of the Sarasota Sailing Squadron. Had a great 1-week stay in Sanibel. Roy Massey at Ace Performer was great, I was able to swap out a broken boom and get back on the water in one hour (this was on a Sunday where the store's normally closed). Folks at Sanibel Inn were very nice, watersports manager Chris let me borrow a bike lock to lock up the board and rig to a fence post (through footstrap and boom) so I could just unlock and launch from their beach. Got in some cruising and freestyle sessions on the Causeway and a planing session on a 6.9 (super-flat on the North side of the first island after the toll booth). Nice break from the winter blues. Glad to hear Roy is still doing his Ace Performer I've bought a bunch of stuff from him over the years. I just came back from 6 wks in Plam Harbor had some good sessions at Howard PK. Lots of days at 10knts or less but a brought a long board down and it was good to be out on the water no matter. Home in New England and traded the board rack for the ski rack H2O can be fun in both liquid and frozen........states.